Nanny Poppinz of Ashburn Virginia provide 24/7 Nanny Childcare Options to the Northern Virginia Area. Nanny Poppinz recruits, evaluates, and refers the finest quality Nannies to each of our Northern Virginia area clients. It is exciting to offer our parents a Nanny childcare option that they may not have considered before and that is a caring Ashburn Nanny. We understand that Nanny childcare needs do not just happen during normal business hours; therefore, Nanny Poppinz offers our services 24 hours a day, 7 days a week, including holidays. Nanny Poppinz will match the unique needs and expectations of your family with a qualified Nanny in Northern Virginia and then schedule for you to interview the Nanny at no upfront cost or fee. Once a confirmed Nanny match is made, you will be charged a referral fee. Our intent is to give the families of Ashburn, Sterling, Manassas and all of Loudoun and Fairfax Counties peace of mind with your childcare selection so you can work, travel, entertain, or just have some fun while your children are receiving the quality, loving Nanny childcare they deserve and you desire. Families and Nannies receive the highest level of customer service from Nanny Poppinz of Ashburn, Virginia. We are attentive and listen carefully to your needs, and then we find the best match so that each family and Nanny are happy with the outcome. Whether your Nanny needs are full time, part time, after school, or temporary, we will find a way to help you. Our standards at Nanny Poppinz, as we serve Ashburn and Northern Virginia, are to ensure that complete background and internet checks are run on each Nanny, at least 3 years of Nanny childcare experience is verified, and CPR (or be certified within 30 days of hire for permanent referrals) and First Aid certification is up to date. As part of our Ashburn Nanny recruitment, we provide a thorough screening process and meet (face-to-face) with each Nanny. Nanny Poppinz is the only Nanny agency in our area available to you 24 hours a day, 7 days a week, including holidays. We understand the different circumstances that come up for our families, and Nanny Poppinz of Asburn is here for you during those times. In addition to serving families in Loudoun and Fairfax Counties, Nanny Poppinz of Ashburn offers wonderful work opportunities to qualified Nannies who are reliable, trustworthy, and willing to be an important part in your child's lives. Whether you are a family or a Nanny, please let Nanny Poppinz have the opportunity to help you with your needs in the Northern Virginia Ashburn area. Nanny Poppinz looks forward to working closely with you to find the perfect solution to your Nanny childcare requirements. Nanny CPR, First Aid and AED training for the Northern Virginia area is provided by Frontlines CPR. Please visit www.frontlinescpr.com or call 703-304-3338 to make a reservation. Identify yourself as a Nanny Poppinz Nanny when you make the reservation and you will receive a discount. After the completion of the course and when you are referred as a part or full time Nanny Poppinz Nanny you will need to send the course receipt to Nanny Poppinz and you will be reimbursed by Nanny Poppinz for your CPR training cost. For information on how to become a Nanny Poppinz Nanny please call Dasly at 954-899-3828. Nanny Poppinz of Ashburn proudly serves ALL Ashburn and Western Northern Virginia suburb area zip codes. Nanny Poppinz also offers Nanny referral fee discounts to Military, Law Enforcement and Federal Employee families. 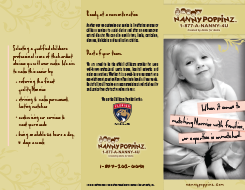 Nanny Poppinz provides corporate childcare and is the proud stadium Nanny childcare provider for The Miami Marlins.